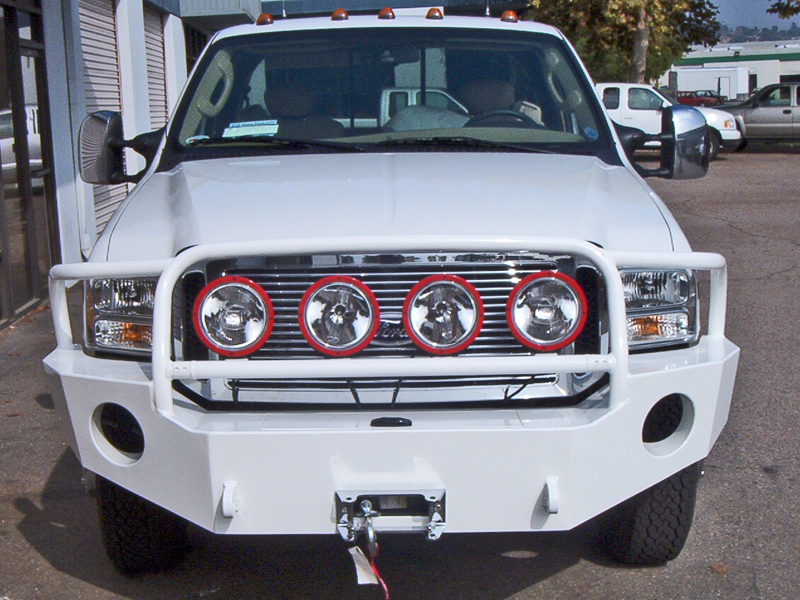 Aluminum Winch Bumpers, Tire Racks, Roof Racks and Off Road Accessories. All front winch bumpers now have vents and the Aluminess “A” Cut into the front. Products shown with available options. 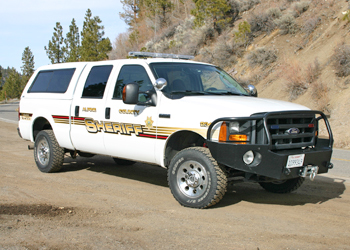 Lights, shackles, receivers, and brush guard crossbars not included in standard bumper price. 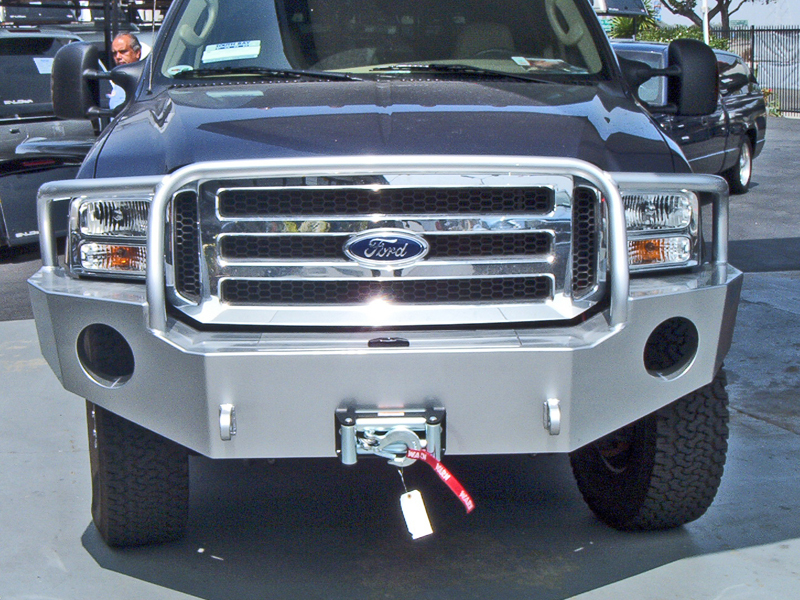 The Aluminess front winch bumpers for the 2005-2007 Ford Super Duty truck will hold a large winch and come with integrated tow hooks. Wet and salty environments can wreak havoc on steel bumpers and make them rust out in no time. 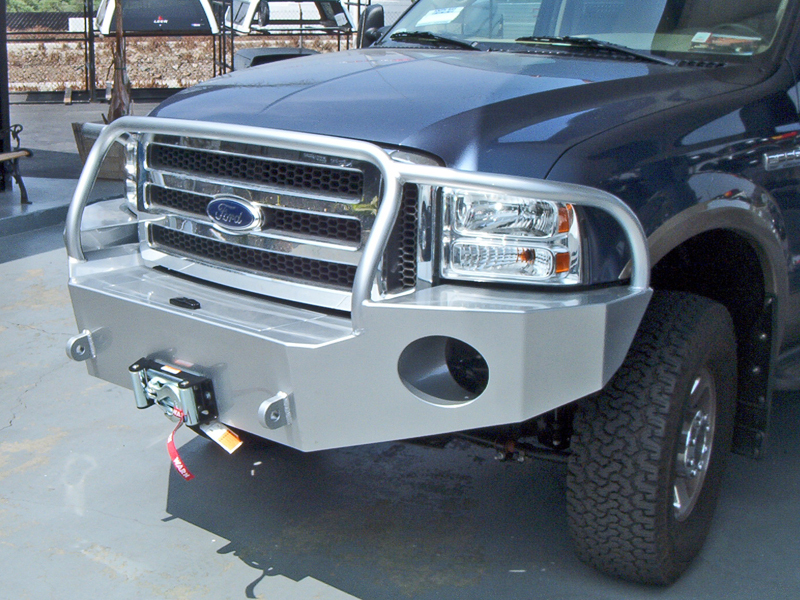 Aluminum doesn’t rust, so you can be sure that your Aluminess off road bumper will hold up even in salty environments. The lighter weight of aluminum also prolongs the life of your brakes, tires, suspension, and steering when compared to steel bumpers. Despite it being light weight, it is still very strong. Aluminess bumpers have survived collisions with deer, bear, and elk. 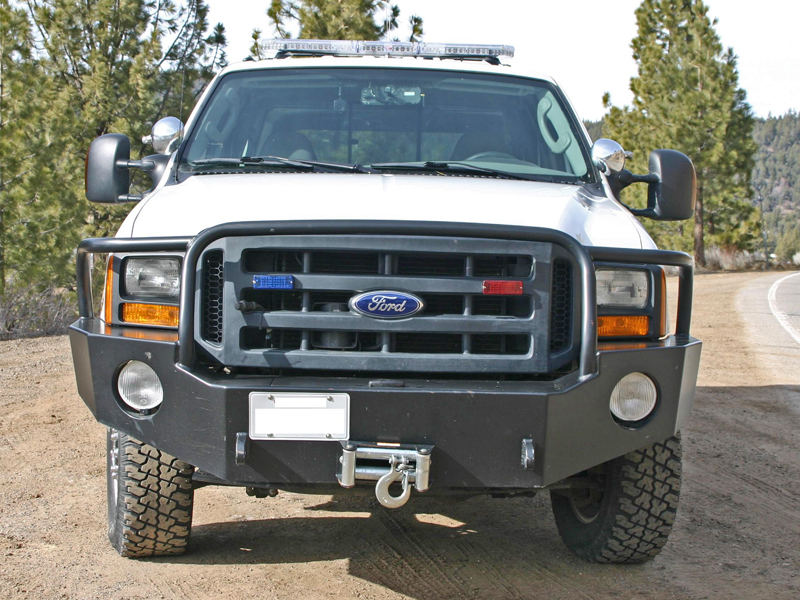 The front winch bumper for the 2005-2007 Ford Super Duty truck was designed specifically for the vehicle to match all of the body lines. This off road bumper looks as good as it functions. Download the full installation manual for this product. This warn winch affordable and bolts right into the front bumper. If you are worried about getting stuck 100 miles from another person, a winch is a great insurance policy. This economy winch from warn is perfect for the casual winch user. It is also a bit more compact for tighter spaces. If weight is a concern then this is the perfect winch for you. It comes factory with a synthetic line which cuts way down on the weight. The Lightforce 170 Striker lights outperform many larger lights. It’s compact size makes it an easy install on most vehicles, and with a set of combo or spread filters, it is incredibly versatile creating an ideal peripheral light pattern. These are the most common lights run in our full size front bumpers. They shoot a short, wide beam that is perfect for cutting through fog. 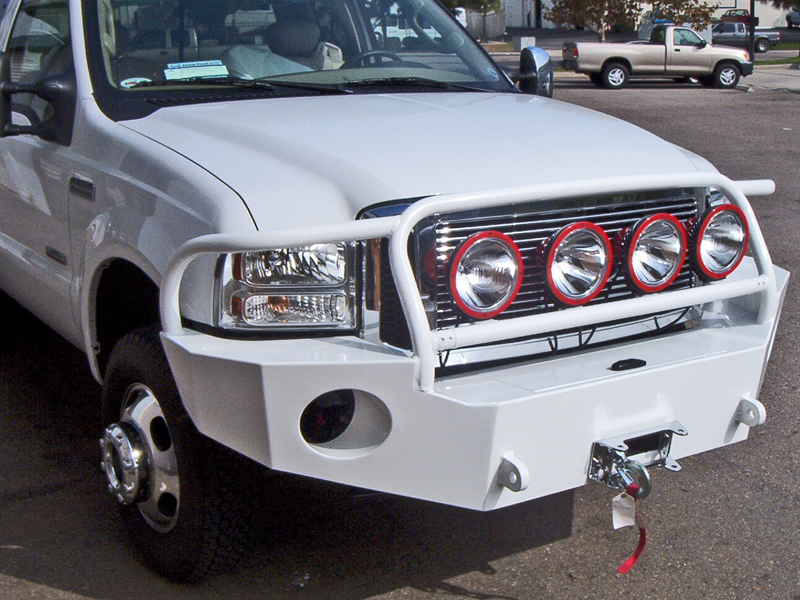 This option is perfect for those of you who want to protect your front end from wildlife, and you are running a winch. The removable crossbar allows you to take the winch in and out of the storage compartment for service and installation. Our Shackles are rated at 8.5 tons to ensure you can get out of the stickiest situations. We powder coat them the same black as our bumpers so ensure a great look along with great functionality (other colors upon request and may have an additional charge). Shackles are sold in pairs. 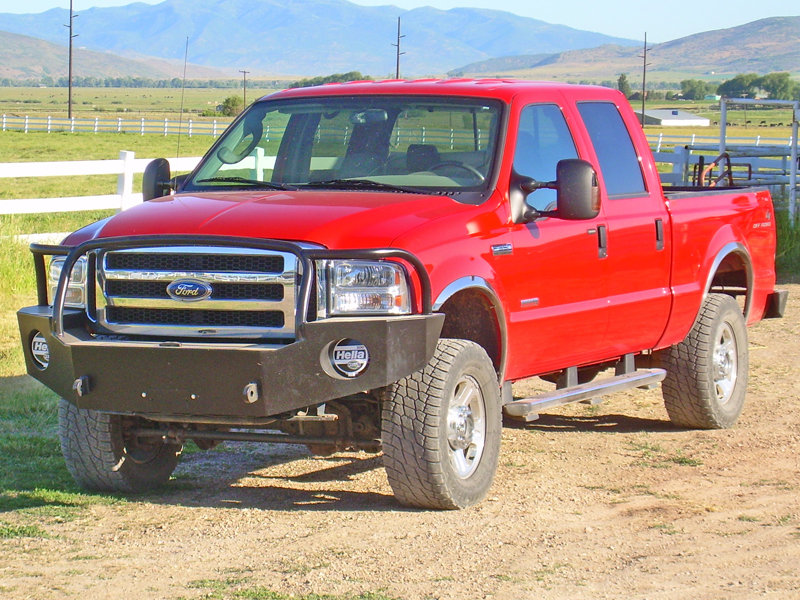 Adding a 2″ hitch to your front bumper offers great versatility. It can be used to hold a portable winch, or even a bicycle rack. The Aluminess receiver uses US standard radius corners. Accessories with sharp corner radius may require an adapter to fit in our receiver.